I actually got sent a couple of these to review – and they arrived in a nice enough presentation pack – there was also a lovely stemmed tall glass included in the pack but unfortunately it was broken in the box – boo hoo – so I used one of my own trusty Pilsner glasses for the review instead. On pouring there weren’t many bubbles and it a had noticeable pale light straw colour – much lighter than other amber pilsners I often drink. There was a small frothy head – which disappeared pretty quickly. Aromas were certainly not hoppy – but there was a slightly grassy and metallic-lager yeast whiff coming through – much like many other continental lagers. The flavour is decent enough – but to be honest doesn’t blow your mind. It’s light and breezy with plenty of appealing sweetness – more honey than malty. It has a final bitterness – that lingers and offers good balance – however it’s not a particularly hoppy bitterness. Generally – it’s a pleasant enough Pilsner – and bodes well against most of its contemporaries – and definately better and much more enjoyable than most generic lagers. There’s not much carbonation or fizziness going on – so it’s not a refresher from the midday sun – more a pre-dinner drinkypoos – with some salty snack! The “Öko Test” magazine compared 46 beers including known brands distributed throughout Germany and regional brands. The Warsteiner Brewery’s Premium-Pils was rated “First Class” by the Öko-Test jurors as the best beer distributed throughout Germany from a family-run brewery (August 2009). Our company only purchases and processes quality hops that meet our strict quality requirements. 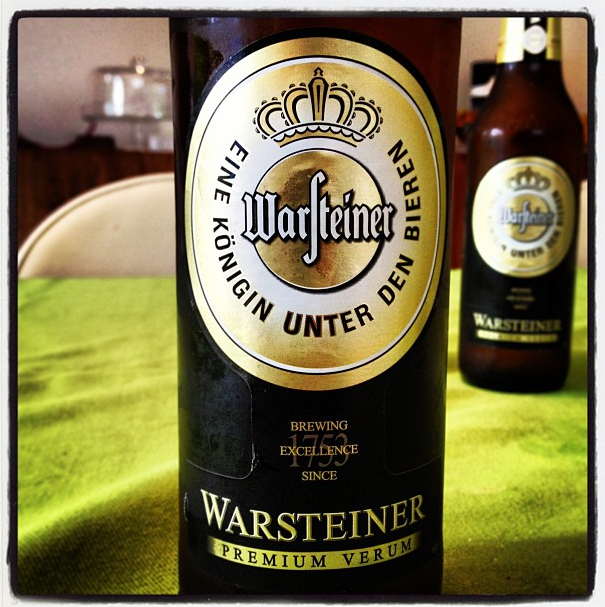 The special combination of bitter and aroma hops is unique and is a key component of the well balanced, mild-hoppy WARSTEINER Premium Verum. The light golden yellow color of WARSTEINER Premium Verum beer is obtained thanks to none other than the finest ingredients and an especially gentle, careful brewing process.